After the mediocre “Robin Hood”, the disappointing “Prometheus”, the pretty bad “The Counselor”, and “Exodus: Gods and Kings”, which looked so not like my cup of tea that I decided to skip it, Ridley Scott had quite a lot to make up for. Thus, as much as this sounded and looked to be right up my alley, I entered the movie theatre a little wary. 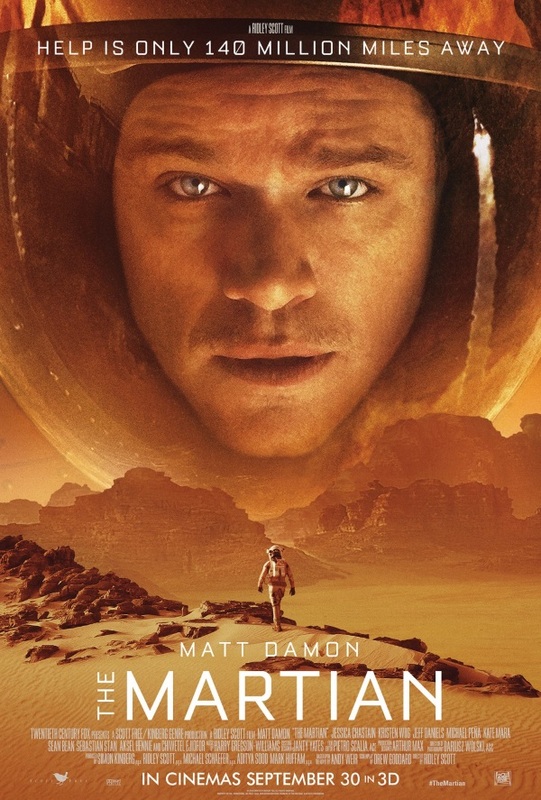 And while I wouldn’t say that he redeemed himself completely with it, “The Martian” at least – and finally – was another great movie by a director who was once cherished and revered for his unforgettable contribution to (science fiction) cinema. Not having read the novel before I watched the movie, what caught me quite by surprise was how funny “The Martian” was. Which, as I found out later when I finally read it (which I started pretty much as soon as I left the movie theatre), is only true in tone and spirit to Andy Weir’s great novel; however, kudos also has to go out to Drew Goddard and Ridley Scott for sticking with it. They do a great job of capturing the essence of the novel, and bringing it to the big screen, staying true to the text, but trimming it down here and there to get it down to a feasible running time. However, I for one didn’t really miss anything that got skipped, and also quite liked the epilogue that was added, which rounded out the story quite nicely. Also, some jokes (like Mark Watney’s complaint about his colleague’s taste in music) actually worked better here than in the novel. Overall, they did a great job in making the movie just as funny and entertaining as I found the novel to be. There were many funny moments which had me laughing out loud (a certain allusion to “Lord of the Rings” was especially brilliant, thanks to casting). Despite all the humor, though, “The Martian” never lets you forget too long about Watney’s struggle, and that he’s stranded all alone on a different planet, 140 million miles from home. The more dramatic and/or tragic moments contrasted the funny bits nicely, gave gravitas to the proceedings, and made sure that it didn’t degenerate into a mere laugh-fest. I also loved that science played a very big part in the picture, and in saving Mark Watney’s life. There aren’t that many science fiction-movies who are that heavy on the science-part of the equation, thus I really appreciated that. Matt Damon, having already practised playing a stranded astronaut in Christopher Nolan’s “Interstellar”, has the burden and responsibility of carrying the movie, and does so with a lot of charm. He’s supported by a huge ensemble cast who all do their part in making the movie even better. The Mars-landscape presented here is very realistic and believable, and the score by Henry-Gregson Williams adds some gravitas to the proceedings. Still, for me, the biggest strength of the movie was the humor, which made it incredibly entertaining . The only reason why I didn’t rate it even higher was that I found “Interstellar” and especially “Gravity” a little bit more gripping. Other than that, “The Martian” was a great science fiction-movie that managed to at least partially restore my faith in Ridley Scott. This entry was posted in cinema 2015, movie reviews, new releases and tagged 2015, Andy Weir, cinema 2015, Drew Goddard, Matt Damon, Ridley Scott, science fiction, The Martian. Bookmark the permalink.